Not much of a view though! 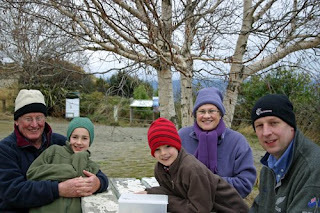 It was a cold, grey drizzly day so we decided to take Robin & Phyllis & go geocaching. We tried to do a multi cache around the front of Lake Hawea but we couldn't find the second waypoint. Instead we sat & had lunch & then tried one final time to find that elusive way point. We didn't find it so we headed off to Hawea View to do this cache. We have tried this cache 3 times previously & each time we have been stumped by the tour buses that pull up & everyone taking their touristy photos. This time we waited for a car to pull off & then retrieved the cache. Then the inevitable happened just as we were going to rehide it a car pulled up. We got out the cakes & sat down & had something to eat & of course a photo, while we waited for that couple to leave. Eventually we managed to re hide the cache.